30 years ago, Shane Black sold his first screenplay to producer Joel Silver. An action flick about a strait-laced detective forced to team with an unhinged cop, Lethal Weapon was a huge success, spawning multiple sequels. Black’s storytelling set a new standard for action comedies and redefined the “buddy film” genre. He was one of the highest paid screenwriters in Hollywood, writing movies like The Last Boy Scout, Last Action Hero, and The Long Kiss Goodnight before disappearing in the late ’90s. Black resurfaced in 2005 with Kiss Kiss Bang Bang, his directorial debut. A neo-noir buddy comedy, the film follows a thief impersonating an actor and a private eye as they attempt to solve a murder. In 2013, he returned with Iron Man 3, a Marvel comic book movie that doubles as one of Black’s signature action-comedies. A snarky superhero and his by-the-books sidekick have to rescue the President of the United States from a terrorist who isn’t a terrorist at all, but rather an actor portraying one. Oh, and it’s set at Christmastime, too. It’s the most Shane Black thing ever, until The Nice Guys that is. 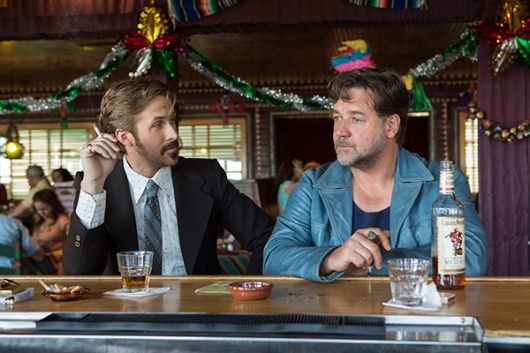 A new trailer has been released by Warner Brothers Pictures for The Nice Guys, the new movie from Kiss Kiss Bang Bang and Iron Man 3 director Shane Black starring Ryan Gosling and Russell Crowe. The movie is set in Los Angeles in the ’70s, and follows a private eye and an enforcer working together to find a missing girl. Also starring is Kim Basinger, Matt Bomer, Margaret Qualley, Keith David, and Ty Simpkins. You can check out the new trailer and read a synopsis below. 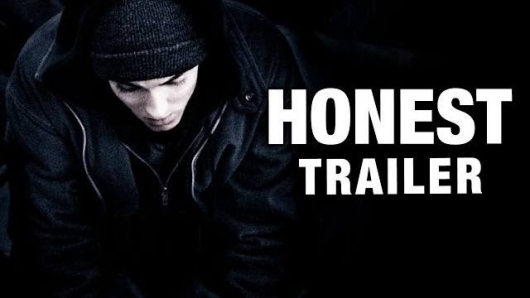 Having ran out of remakes, reboots, and sequels to cover (for the week), the gang at Screen Junkies pull a totally random Honest Trailer out today with 8 Mile, the Curtis Hanson directed 2002 semi-biopic of Eminem starring the rapper himself, Mekhi Phifer, the late Brittany Murphy and Oscar winner, Kim Basinger. Narrator Jon Bailey immediately pokes fun at the “true story” nature by saying that since Rabbit has brown hair, it’s totally different. One thing for sure, no one expected Eminem of all people to make the successful music star – actor transition especially after critical and box office flops like Mariah’s Glitter, and Brittney’s Crossroads. Watch the Honest trailer below.